Are you familiar with Community Supported Agriculture? By purchasing a “share,” we are able to support a local farm and reap the bounty of their harvest. Its kind of a surprise exactly what you will get, and depends on what is in season and what is doing well. We purchased a share from Singer Hill Gardens, a local group that actually does “urban farming” around Portland. They offer a few different types of shares and we picked the “Harvest” variety, which will bring us not only weekly fresh fruits,vegetables and flowers, but also biweekly fresh eggs and locally made cheese and a “specialty item” such as local honey or jam. It is a 25- week share, so we will get packages from June to November. I am so excited and cannot wait start receiving packages! While fantasizing about what exotic new veggies this summer and fall will have in store for me, I can’t help but think of one of my favorite spring veggies: Asparagus. I have been seeing a lot of asparagus “ribbon” recipes lately and wanted to try this new technique out! I decided to use it as a topping on a whole wheat pizza crust- a recently discovered recipe from smitten kitchen that has become a quick favorite around here. She says not to use more than half whole wheat flour, but I used 1 cup of whole wheat pastry flour with one half cup of regular whole wheat with good results. I have made it with all white and with half white and half wheat, and I like the whole wheat version best. A couple hours before you plan to serve the pizza, combine dry ingredients and make a well in the center. Pour in warm water and the olive oil, stir until dough comes together and then turn out on a lightly floured work surface and knead 3-5 minutes. Roll into a ball and place in an oiled container. Cover and let rise for 1.5 hours or until doubled in bulk. 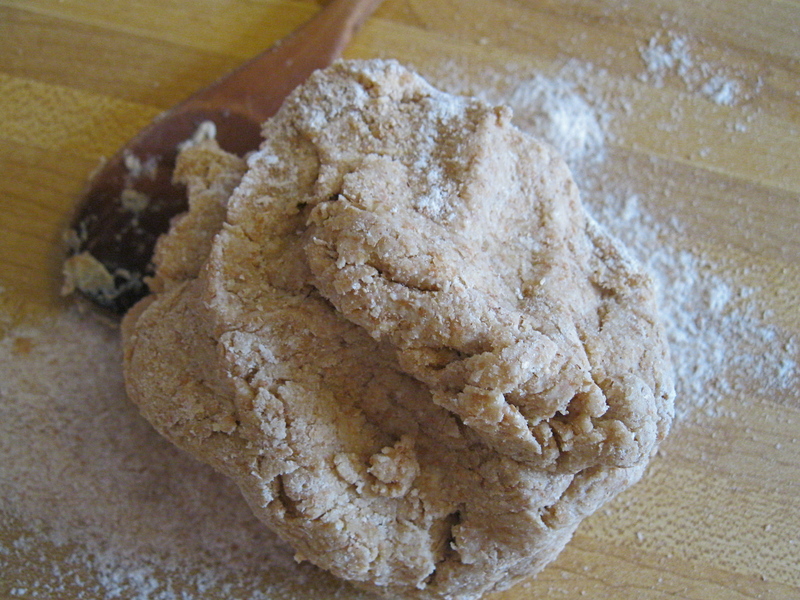 After this rise, roll out dough into a circle and cover again to let rest for about 20 minutes. Meanwhile, preheat over to 500F, with pizza stone if you have one. Roll out dough one last time and transfer to stone or baking sheet. Prick with a fork all over for even cooking and bake 10 minutes, or until light golden but not completely done. For a super easy pizza sauce, I add crushed garlic (crushed with salt by a mortar and pestle is best, but you can use the blunt part of a knife also) and the oregano, rosemary, and parsley to the tomato paste, then thin in with a couple tablespoons of water. I have found that this is the best way to keep the pizza crust from getting soggy- anything too “saucy” and you have a droopy, wet pizza. Another plus- tomato paste is loaded with lycopene, a super healthy antioxidant! 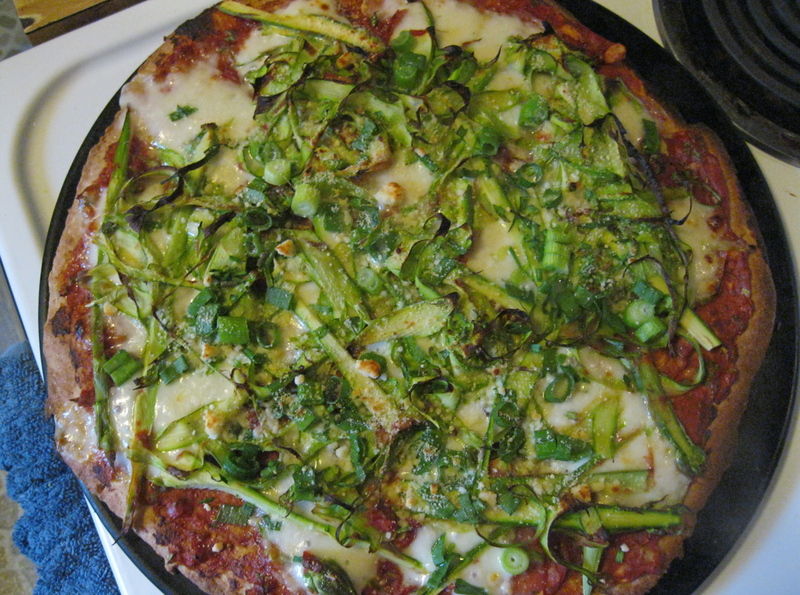 Top the prebaked crust with the pizza sauce, then the cheese, then veggies and season as desired. Bake 5-10 minutes longer or until cheese is melted and vegetables are cooked. I like to serve pizzas with kale chips! I actually dreamt I was getting ready for my wedding and I was fashioning my bouquet out of kale… maybe I should go easy on the kale haha.